My tutor's comments: To be brutally honest I didn't much like this one. You don't need to be dismayed by this because I think your other work redeems it. I think this drawing suffers from being picturesque, nostalgic and sentimental, and working with pastels, it is all too easy to cross this fatal line. Picturesque means simply that it appeals to commonly held notions of what a beautiful picture consists of. It has been said that in the post modern era, it is no longer possible to make art that is beautiful or that appeals to notions of beauty without its becoming kitsch. There are elements in this drawing such as the reflection in the flask that show an engagement in looking but on the whole this one seems contrived from an idea of what a picture might be. 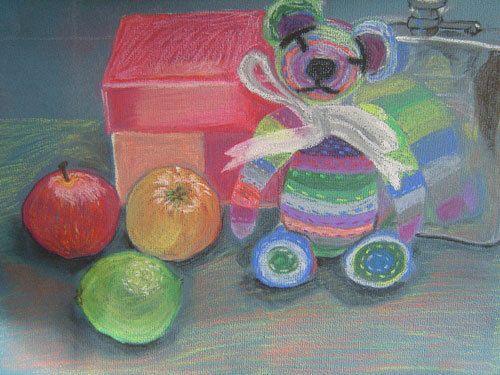 My response: I know it's twee, I knew it as soon as I picked the bear and a pink box to be part of the drawing. And it probably shows that I didn't think much about why I chose them. But I truly enjoyed and was happy with my ability to describe the proportions and colour tones of the bear and it's reflection in the hip flask. That's what I was mostly aiming for. I have also been aware that even though I like this drawing, there is a part of me that cringes inside to show it to people. The responses have been mixed, and some people do seem to like it. Nevertheless, I have shown it, as it's been part of my drawing process. And again, it's given me a lot to think about in terms of beauty and what a good drawing "should be". I really like the way that this drawing brings out the kid in you and in some ways displays your vulnerability. After all, isn't it in drawing and art where children first truly begin to learn how to express themselves? There's nothing wrong with tapping into that now and then, in fact, it's probably necessary to stay in touch with it! Kudos to you for having the guts to show this to the world and reminding us that we are all kids at heart (or at least want to be! ).